Three-dimensional scanners are one of the newest and most futuristic gadgets in a police investigator's toolkit. These magical, handheld little devices can create 3D models of a crime scene in mere minutes. And the technology just keeps getting better. 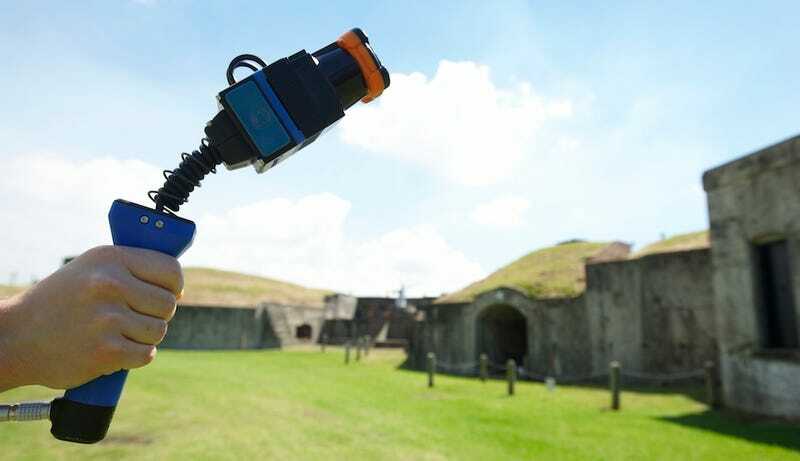 The latest happy story about the police and their 3D scanning equipment comes from Queensland, Australia, where police have recently invested in the goofy-looking but absolutely amazing Zebedee handheld mapping scanner. This gadget uses lasers in the same way that bats use sonar to find their way around unlit environments. All you have to do is walk around holding the device, and the Zebedee shoots lasers about a hundred feet in all directions; it then simply measures what bounces back. It's the same technology researchers used last year to scan the entire Leaning Tower of Pisa in just 20 minutes. It's also popular with archaeologists and spelunkers. The Queensland police use the Zebedee for a very specific purpose, though: it makes excellent maps of crime scenes. Because all is more or less lost once police open a crime scene back up to the public, 3D scans give investigators a snapshot of the scene that they can look at from all angles. Queensland police say they also hope to use it for crash sites, too. "The benefits of this new technology will reduce interference at a scene, save time and allow access to previously hard to reach areas such as step declines and bushland," said Queensland Police Commissioner Ian Stewart in a statement. Stewart added that the Zebedee's quick capture "gives our people time to do other things."